Source: CICH graphic created using data adapted from Statistics Canada, Participation and Activity Limitation Survey, 2006. https://www.canada.ca/en/employment-social-development/programs/disability/arc/disability-2006.html#s3 -accessed June 17, 2017. In 2006, 30% of parents with children 0 to 14 years of age, who had a disability, reported that they worked fewer hours than they would have chosen to work. 21% did not take a job offered to them. 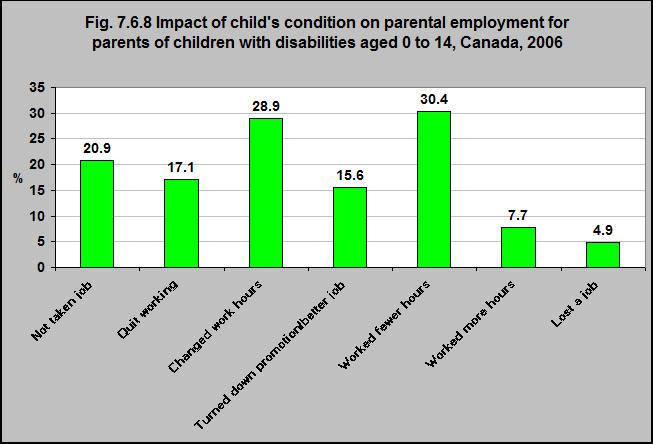 When a child has a disability, it can have a significant impact on his or her parent’s ability to work.